If you are concerned about the possibility of your lawn being diseased, you need to make sure that one of the area’s top lawn treatment services is on your side. It can be difficult to determine whether your grass is just stressed from drought, poor nutrition, or other environmental factors, versus having some sort of pathogen invader. And then telling what specific pathogen is involved is a whole different puzzle to solve. Atlanta’s top lawn treatment services have specialized training in the diagnosis of turf diseases. It’s important to know exactly what is going on with damaged grass. Because using the wrong products can cause even more damage to the turf. There are a wide variety of conditions that can cause extremely similar symptoms, which can make lawn disease treatments awfully complicated. Keep reading to learn why fungicide is one of the top lawn treatment services, and why your lawn needs it too. Are all fungicides created equal? No – and it’s crucial to note that there is not one single fungicide that can treat all fungal infections. Knowing what type of fungus is damaging your lawn is the first step in the lawn treatment plan. Dozens of fungi can infect turf, and many of them look the same to the untrained eye. That’s why a suspected fungal infection requires the trained eye of a top lawn treatment service. Can’t I just apply fungicide myself? CAN you? Sure. SHOULD you? Absolutely not. Unless you have specialized training in lawn fungal infection identification, it’s simply too easy to use the wrong product for the type of fungus in your yard. Another common problem is that people who try to DIY their fungicide application don’t use the product correctly, or they measure the amount wrong. You could end up causing even more damage to your lawn. 1. The turf’s environment must present conditions that favor an infection. This can mean excessive moisture or dryness, lack of nutrients, elevated temperatures, and various other issues. 2. The grass is susceptible to infection if the grass plant is unhealthy. Typically poor environmental conditions cause this. 3. A pathogen, such as a fungus, must be present and able to take hold within or among the damaged grass shoots. As you may guess from the information above, keeping your lawn healthy is the best and first line of defense against just about every type of pathogen. Proper watering, nutrition, trimming, and aeration will keep the grass healthy and strong, which makes it better able to fight off infections. 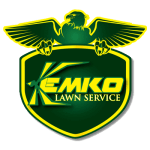 Kemko Lawn & Shrub has been considered one of the top lawn treatment services in Atlanta for more than 30 years. We have the expertise your damaged lawn needs. Have questions about the top lawn treatment services in Atlanta? Click to see if it’s on our FAQ list.